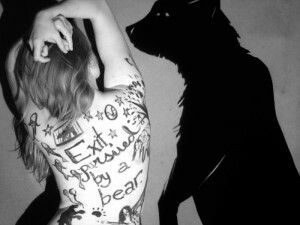 Exit, Pursued By A Bear is a multidisciplinary puppet play about Evelyn – played by Adriana Disman – whose dreams are haunted by a grizzly bear. She also has recurring flashbacks of her dead father, all while talking to a prophetic beggar, both of which are played by David Schaap. It will be running at the Theatre Passe Muraille for the duration of the festival. There are a lot of elements in this show, the most spectacular of which is a full-sized bear puppet, controlled by two people. It’s really well done: its movements are believable, even for a dream sequence, and it looks just plain cool. It was the best part of the show. There were other puppet elements as well, both shadow and stick, that felt slightly less spectacular – particularly the shadow puppetry, as a large part of the time it was fuzzy or the puppeteers’ heads would peak into the sides. The show is well performed. Although suffering from the occasional articulation issue, Adriana Disman and David Schaap were entertaining and believable. Schaap in particular was good at switching between the beggar and the father, giving each a distinct and touching performance. There was also a live band which eventually got up and became part of the action. While they were all excellent performers, I don’t feel that their songs were overly significant to the production. There are a lot of excellent elements included in Exit, Pursued By A Bear, but for me, they don’t quite come together as cohesively as I would like them to be. The show felt a little messy and vague, suffering from a tad too many things happening, and often all at once. While the show is worth seeing for the bear alone (seriously, it’s awesome) and the performances and music were good, overall this play ends up being a bit confusing and messy. – Playing Aug. 8 at 10:30pm, Aug. 9 at 8pm, Aug. 12 at 3pm, Aug. 13 at 5:30pm.